If you’d really like a GeekDesk but can’t wait 2-5 weeks for shipping, the Edison Electric desk is a near equivalent at a nearly equal price when shipping fees are factored in. Lifetime warranty on a motorized product is also a big plus. Fast shipping, included for FREE. Lifetime warranty. 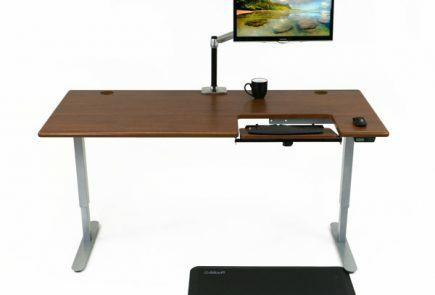 Max height (52”) is the highest available in any electric desk. Assembly is a little more involved than with other brands, requires more hands. Weight capacity is not as great as GeekDesk’s but is more than sufficient for most treadmill desk applications. Doesn’t have programmable height presets like GeekDesk Max. VersaTable makes many products, which is both a plus and a minus. Whereas GeekDesk and MultiTable (ModDesk) focus solely on manufacturing desks they are also smaller companies and offer lesser warranties on their products. VersaTable has a deeper inventory and better scale economics on shipping, it appears. Compared to the GeekDesk Max the VersaTable Edison Electric has less load capacity and lacks programmable height settings, but goes 2” higher (really only an issue for VERY tall people). VersaTable is a well-established company that makes a wide variety of desks as well as chairs, file cabinets, and various other office products. Of all their products only one is suitable for use in a treadmill desk application, and it’s a pretty good option. 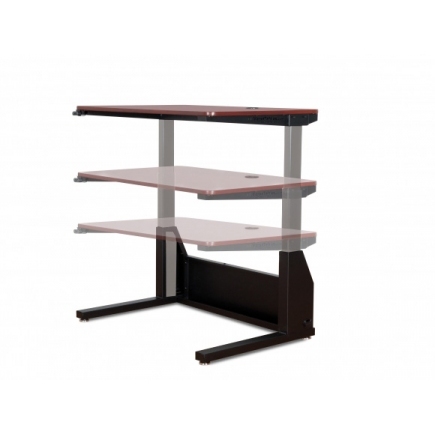 The Edison stand up desk comes in four different widths (36”, 48”, 60” and 72”) and two different depths (24” and 30”). The 36" and 48" wide options are equipped with one grommet hole while the 60" and 72" are equipped with three holes to hide cords and cables, preventing trip hazards and improving aesthetics. The scratch-resistant, stain-proof surface offers 26" of height adjustment with a lofty maximum height of 52”. The frame is made of 14-gauge recycled steel and can be ordered in black, gray or white. Desktops are made of high-pressure laminated high-density fiberboard and can be ordered in white, black matrix, gray matrix, cherry woodgrain or maple woodgrain. VersaTable offers a 28” keyboard arm and tray ($99) or 24” keyboard drawer ($69) and three varieties of monitor arms from $119 to $219. Wheels can be added for $49. One potential concern with the VersaTable design is the structural crossbeam panel runs down to the floor and thus may block the way for the treadmill base to be positioned far enough back so the belt walking area can begin in the right place. With the 24” desktop option there is only 17.5” of space between the modesty panel and the front edge of the table, according to VersaTable’s detailed specifications. Depending on which treadmill base you are using this may be problematic, so for this reason we would strongly encourage you to spend the extra $20 and opt for the 30” desktop depth. Purchasing the keyboard tray option ($99) would completely eliminate this concern even with a 24” desktop depth - most newer tables have their structural crossbeam panels higher up so you can slide your treadmill base all the way to the back wall without interference if you want to. How well does it work as a stand up desk? The VersaTable Edison Electric desk would make a decent standing desk, especially for the very tallest people who may find other desks come up "a little bit short" on maximum height.